Robert Buckley as Major and Rose McIver as Liv. Welcome to Vulture’s iZombie recaps! Yes, we’re starting in the middle of the show’s second season, but as the old saying goes, better late than never. Before we discuss the very meta “Method Head,” let’s start with a quick summary of where we were before the mid-season finale. (It’s like one of those matryoshka nesting dolls, a mini-recap inside of a bigger recap.) When we last visited this positively Canadian-looking version of Seattle, some of Liv’s most important relationships were in ruins. After trying her hand at vigilante justice — and almost dying — Detective Clive Babineaux ended his partnership with Liv because she had crossed the line. He was ashamed of treating her like cop even though she wasn’t one. At the same time, Liv decided to end her relationship with Major. Meanwhile, Ravi discovered his zombie cure is only temporary, which means Major and Blaine will soon be back to their pale glory. 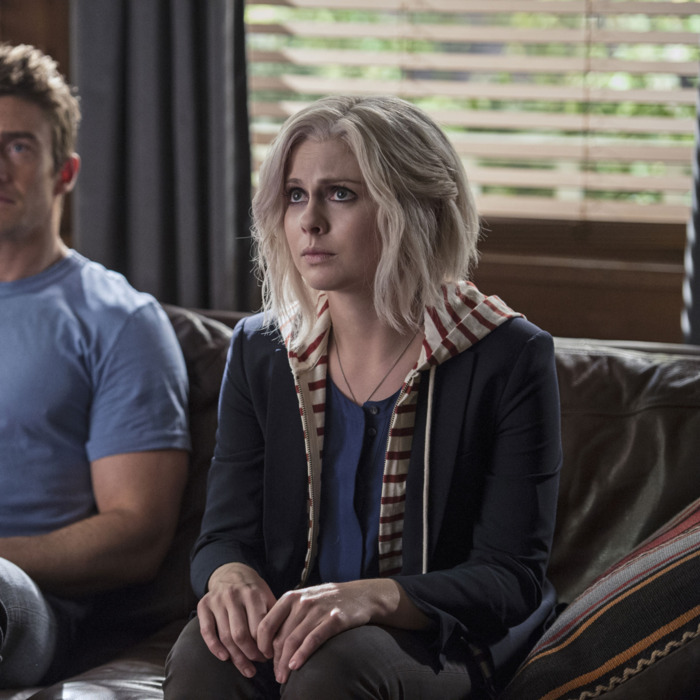 With this series of unfortunate loose ends left dangling, you would think iZombie’s mid-season return would be a moody affair that deals with Liv’s emotional fallout, but, alas, it wasn’t. In a surprising tonal shift, the show skips past all this drama to delivers one of its sillier episodes. “Method Head” opens with Ravi telling Liv and Major and Blaine about his cure’s depressing setback, then proceeds to fast-forward through the holiday season. This means we don’t get to see how Liv handles not being able to help Clive. Don’t forget: When she was stuck on the sidelines in “Cape Town,” it left her devastated. Saving people is the only thing that makes being a zombie bearable. When we finally arrive in the present, Liv and Ravi have been called to the scene of Liv’s favorite show, the teen drama Zombie High, where the lead actor was killed in a scene after someone replaced a prop gun with a real gun. Because of her “expertise” with the show, Clive allows Liv to work the case with him. So, within the first five minutes of the episode, we’ve already returned to the status quo. That’s too bad. I was looking forward to seeing what this show could look like without Liv and Clive working together. The iZombie writers do have some fun with the case, at least. Zombie High shares many similarities with a certain megapopular zombie drama: It’s a self-serious show about survival; a main character dies every season; and the lead actor is very Method. There are also quite a few self-referential jokes, too, which would have been more enjoyable if they didn’t feel so familiar. To be fair, there are some good laughs. As Liv runs on Method-actor brains, we get some gentle mocking of insufferable acting behavior. Also, Clive falling in love with the craft services is a very Psych-esque treat. The show doesn’t use these wrinkles to approach or complicate Liv’s broken relationships, though, so it all feels a bit wasted. As Liv and Clive investigate the murder, we find out the lead actor, Jordan — a.k.a. Marlon Brandouche, as the extras affectionately call him — was pretty much the worst. A whole lot of people who work on Zombie High had reason to want him dead. Jordan’s ridiculous need to do 30 takes for each scene constantly made production run late into the night — and during the previous season, an assistant director died as he drove home from the set at 5 a.m. It turns out that the props master, who was having an affair with the deceased AD, impulsively swapped out the prop gun for a real one after learning the show would move to Los Angeles to accommodate Jordan’s burgeoning film career. Meanwhile, Major is still training Vaughn Du Clark. Since the last time we saw them, they’ve become quite chummy — Major even gives Vaughn a FitBit. Gilda is suspicious, though; she thinks Major is playing Vaughn. To prove her wrong, Vaughn arranges for his head researcher to blow the whistle on the zombie scandal to Major to test his loyalty. Major passes the test … because he planted a bug in the fitness tracker. He knew it was a setup. With this latest victory, Major has further earned Vaughn’s trust, which inches him closer to taking him down. Who else is in peril of being taken out? Blaine. He receives an unexpected visit from FBI Agent Dale Bozzio, who found the funeral home’s number in the phone records of several missing people in Seattle. Blaine’s brain business is up and running again, but he convinces Dale he didn’t know any of the victims. At the end of the episode, though, she returns to the precinct and stumbles across a police sketch of Clive’s suspect in the Meat Cute massacre. She’s convinced that Blaine is the responsible for the city’s disappearances. Exciting, right? Unfortunately, we’ll have to wait several weeks to see where all of this goes. iZombie won’t return with a new episode until February 2.